A black bear is featured here in its natural habitat against a wall of Spruce trees. 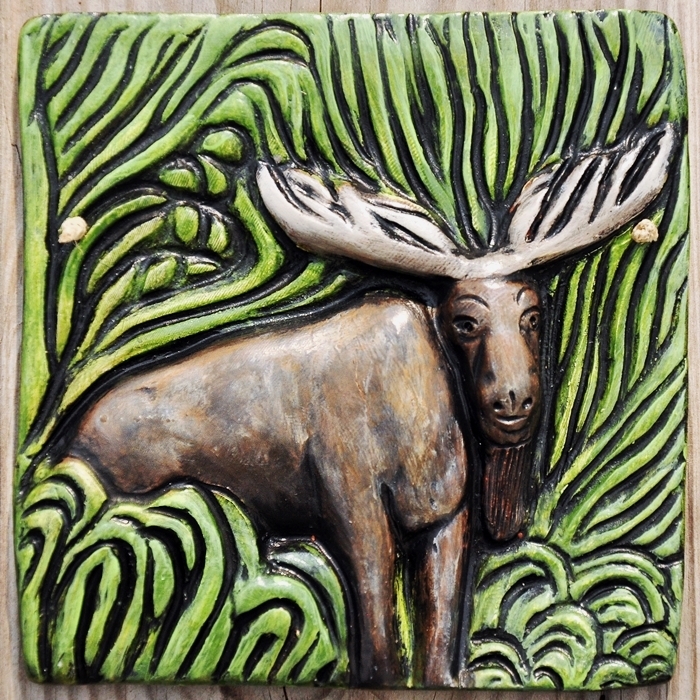 This is another in my series of North American nature tiles. It is made with stoneware clay, kiln-fired, then hand painted with acrylics, sealed with a protective varnish. For the lover of nature and wildlife. Measures approx. 5″ x 5″. Hangs on the wall with durable string. Indoor decor only. This cat like creature could well be a witches familiar. The image is derived from ancient Italy, where the old religion remained strong for centuries. Available in green, black, blue, rust or gold washes. May also be glazed or hand painted. Shown here painted with acrylics. All colors can be customized. 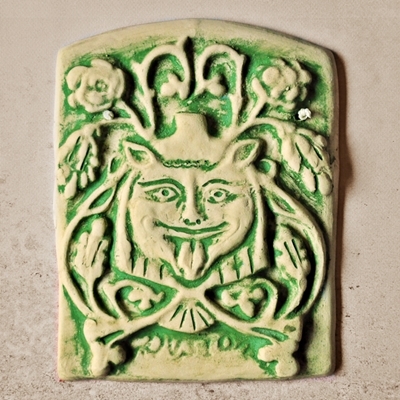 Also available in plain terra cotta, in white with oxide washes (green, black, blue, rust, gold), or glazed. Measures approximately 5.5″ x 5.5″. Reproduction from ancient Italy, Dusio is a trickster figure. One story relates how he tore up the love letters of a maid servant, teasing that she didn’t want the lady of the house to find out about her affair. 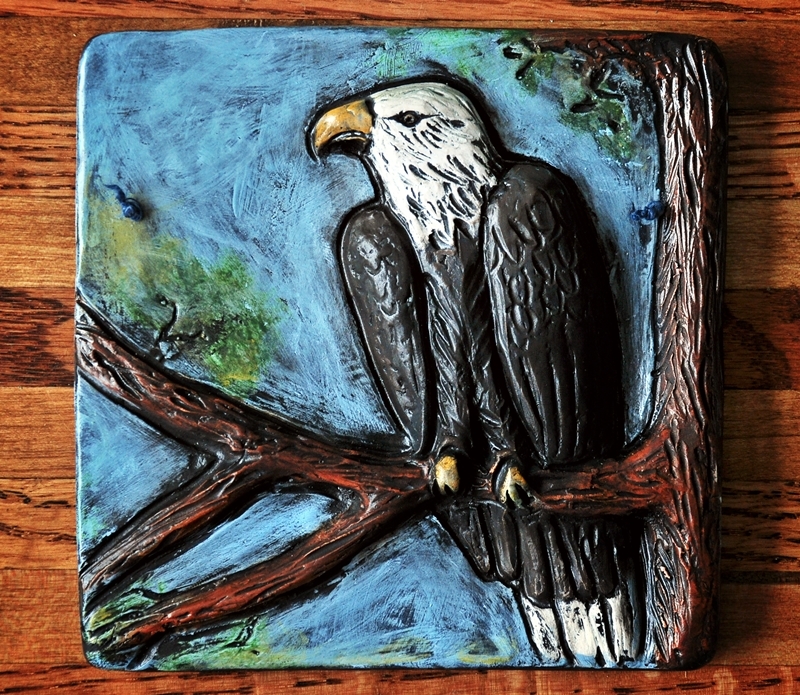 Hand-sculpted bas relief wall tile of a majestic eagle sitting on a tree branch. 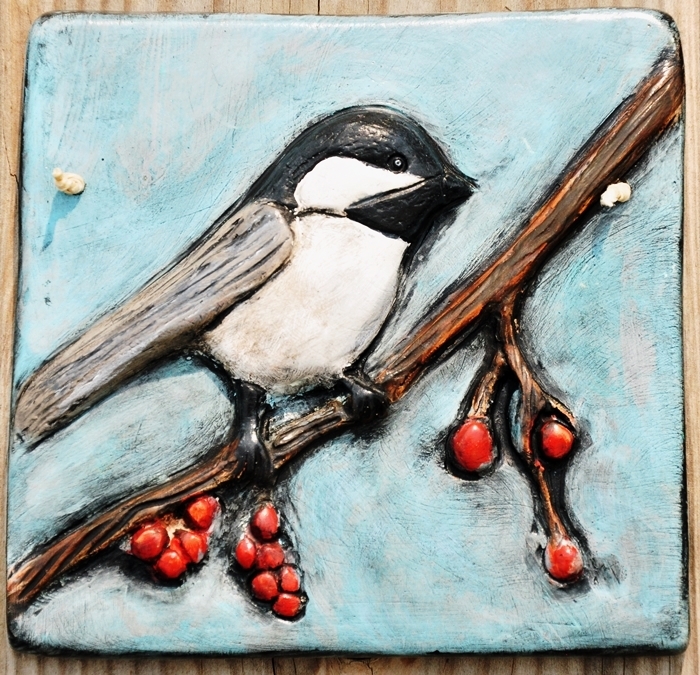 The tile measures 5-1/4″ x 5-1/4″ and hangs on the wall with durable string. 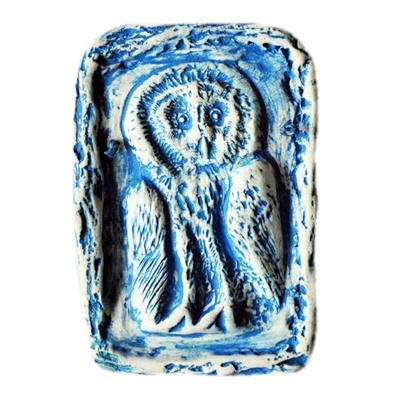 This is an original design made from stoneware clay, hand painted with acrylic paints, plus a clear coat seal for durability. 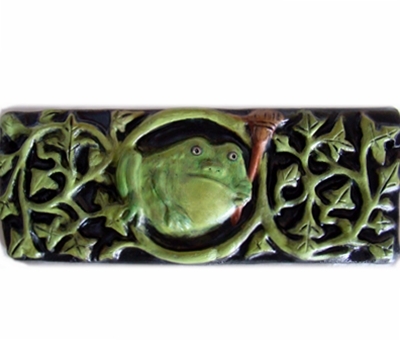 Available also in unglazed terra cotta or glazed stoneware. Please take note that this wall hanging is for indoor use only. 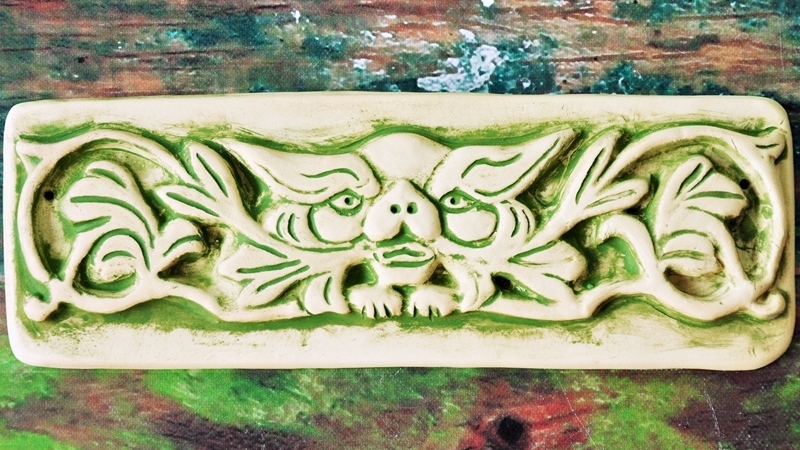 If you would prefer other colors, or unglazed, unpainted terra cotta, please convo me to inquire about a custom order. 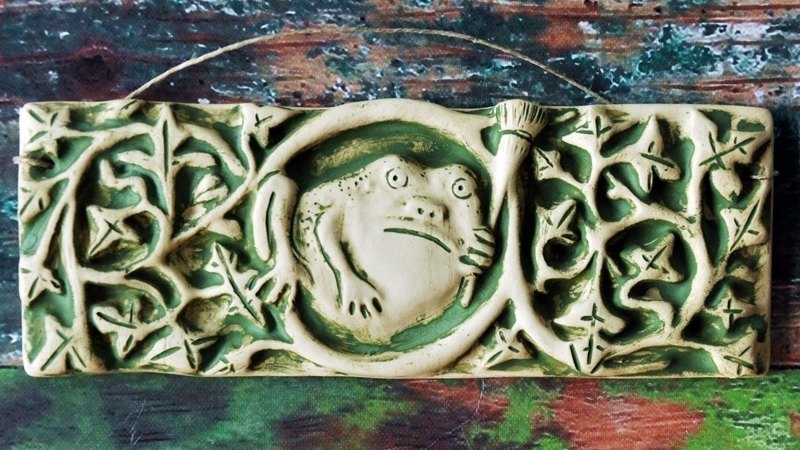 Here, a frog is holding a broom and sits in the midst of Ivy vines. What could be more wonderful? 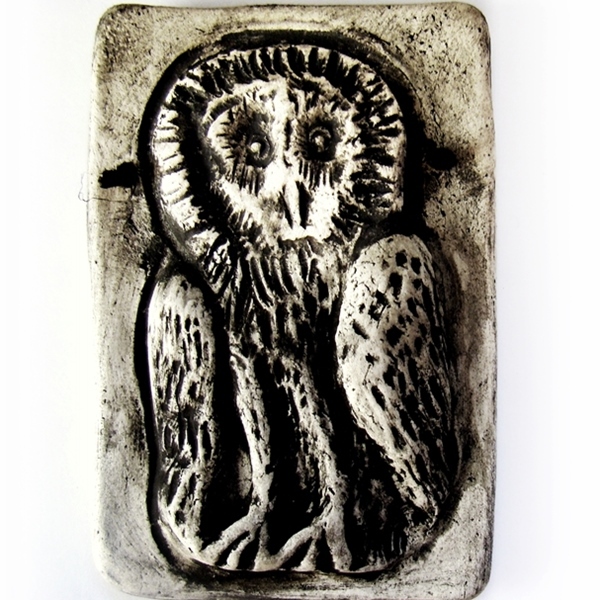 This fun subject hails from ancient Italy and was hand carved from historical drawings. 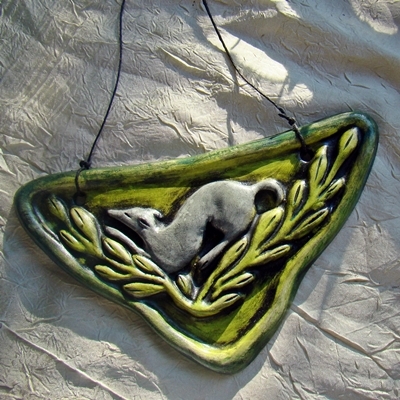 Measures approximately 8″ (20.5 cm)wide and 3″ (7.6 cm) high, and easily hangs on the wall by durable hemp string. Historical reproduction of a greyhound from ancient Italy. The greyhound was often depicted with Diana, the moon goddess, and goddess of the hunt. 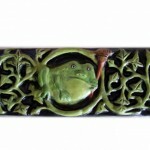 Measures approximately 7.5″ (19.05 cm) wide x 4.25″ (10.8 cm) high, and hangs on the wall by string or can be screwed in. 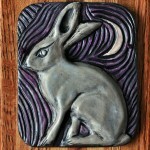 Original design with a Jack Rabbit under a crescent moon. 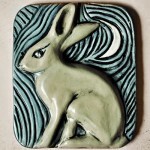 Made from stoneware, and hand painted with acrylics, or may be glazed. Choose colors that suit your décor. Measures approximately 5-1/4″w x 6-1/2″h. Hangs on the wall with durable string. Measures approximately 5″ x 5″. 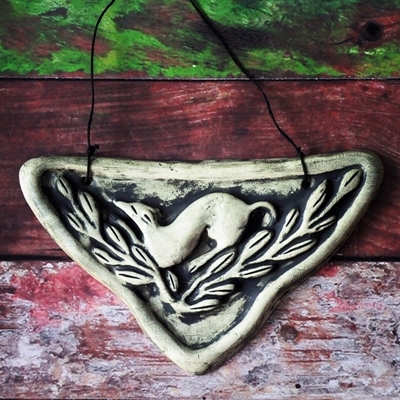 Hangs on the wall with durable hemp string. 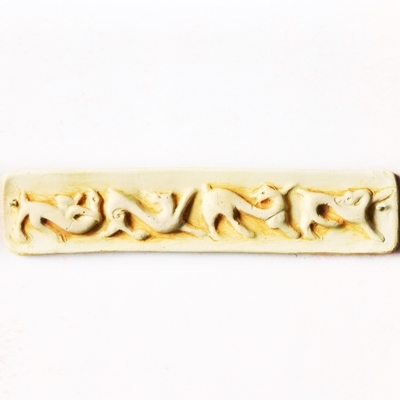 From the Etruscan period, here is a row of four dog like creatures in various poses. 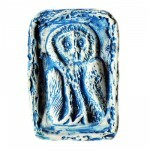 This tile measures approximately 7.5″ (19 cm) long x 1.5″ (3.8 cm) high and would make for a lovely border treatment. A variety of colours are available. Gold wash is shown in product photo. Bear in mind that clay shrinkage varies with initial water content in the clay, type of clay used, and firing temperature. (Plain terra cotta has the least shrinkage.) A precise measurement is not easily obtained. However, I can make matching spacers which will be helpful in your home décor project if you need a tile border of a specific length. If you are in need of a large number, inquire about a quantity discount. 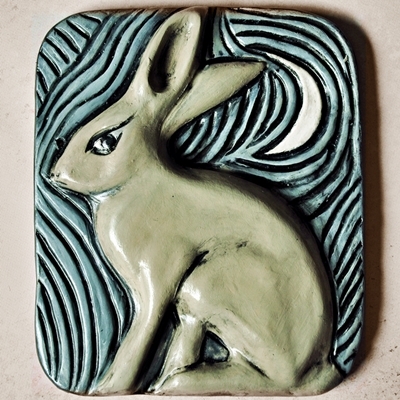 Hand painted stoneware. Colors can be customized. Available in white with oxide washes (green, black, blue, rust, gold), or glazed. 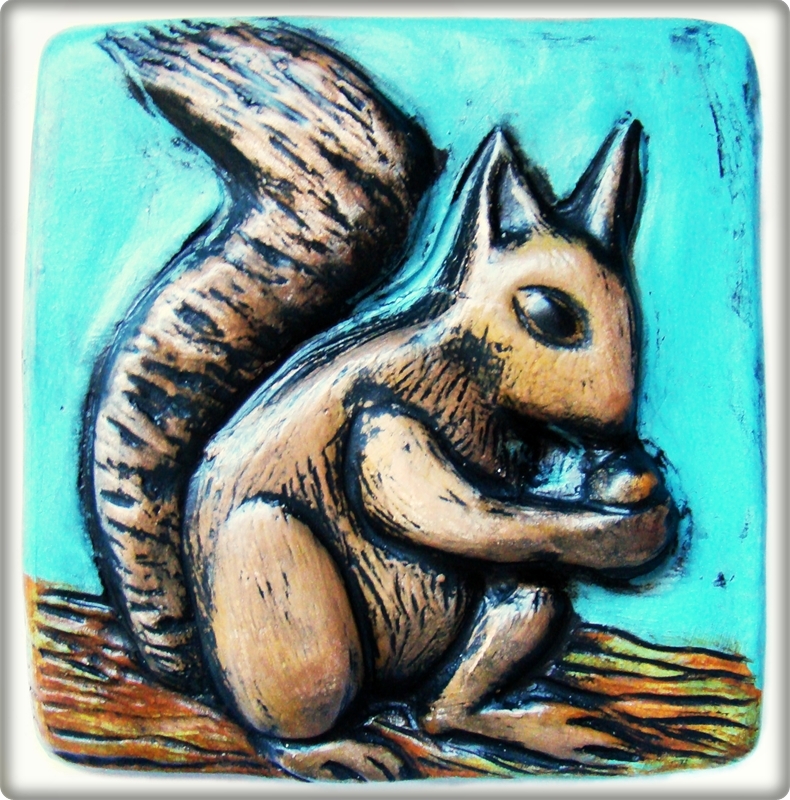 Measures approximately 3″ x 4″. 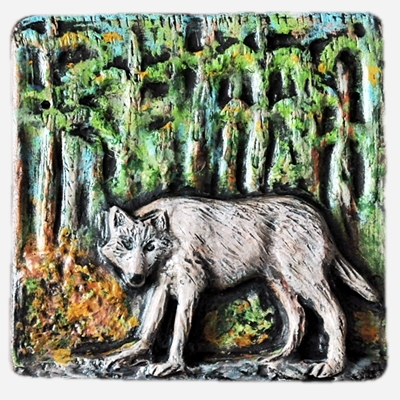 A Grey Wolf is featured here standing on a rock, set against a wall of Pine trees. 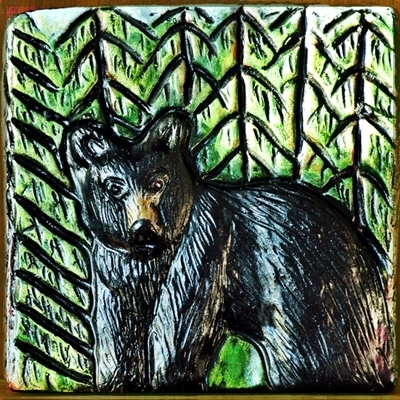 It is another in my series of North American nature tiles. 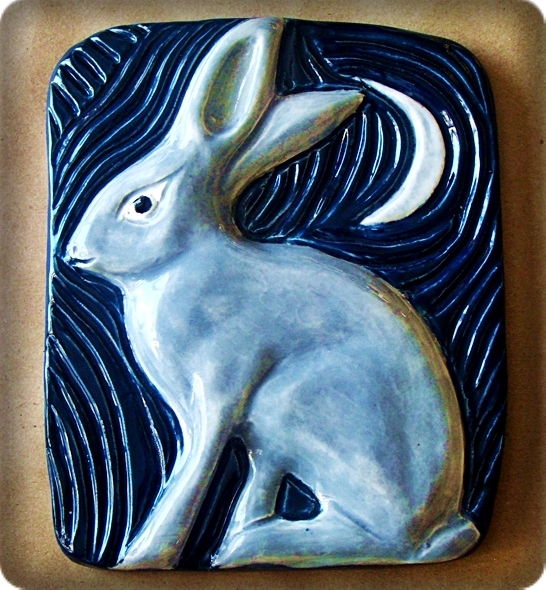 It is made with stoneware clay, kiln-fired, then hand painted with acrylics, sealed with a protective varnish. For the lover of nature and wildlife.